The beaches at Lassi are divided into areas where there are sunloungers for hire and areas that are free to use. A few minutes away from Agostoli facing the open sea lies the purpose built resort of Lassi. It is one of the most developed tourist areas on the island with Hotels, apartment blocks taverna’s and shops. What draws most people to Lassi are it's beaches, which are some of the best and sandiest on the island. Makris Yialos, or long sandy beach, and Platis Yialos, or wide sandy beach, are ideal for families with younger children as they have sands that shelve gently into clear water. Both beaches can be accessed via a short walk from the main street. The coastal road from Lassi to Argostoli passes some small beaches and coves, some of which have tavernas. This road will eventually bring you to The Katavothres or swallow holes where sea water flows underground to emerge in Lake Melissani in Karavommylos on the eastern side of the island. The Water Mill which was built in 1835 still stands nearby. Nearby is the AGIA THEODORI lighthouse which was built in 1825, destroyed by the earthqake and rebuilt to the same design in 1953. 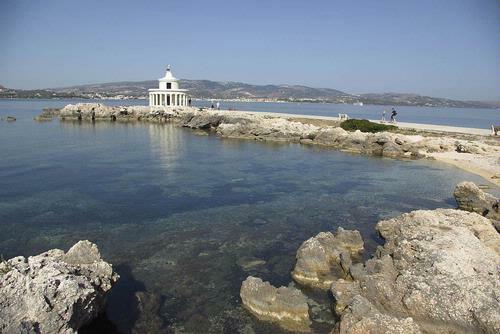 The lighthouse at the entrance to Argostoli bay can be found on the backroad between Lassi and Argostoli. Just off this road can be found the War memorial to the Italian troops that were murdered by the Nazis. This incident was featured in the book and film Captain Corelli's Mandolin.